Cisco Physical Security Operations Manager 5.1 - Management Platform - Cisco Systems, Inc.
Cisco Physical Security Operations Manager provides the scalability required to monitor thousands of IP cameras streaming video through multiple Video Surveillance Managers deployed in a distributed environment. * Interactive geospatial maps and tree. The Cisco Physical Security Operations Manager provides a complete view of facilities, sensors, and alarms in an easy-to-use and intuitive graphical interface. 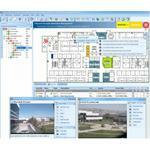 Operators navigate the interactive map by clicking on security zones and areas or by using the hierarchical tree view. The hierarchical maps allow segregation of responsibilities and visibility for different security groups. * Control security sensors, devices, and resources. Interactive maps allow operators to click on an IP camera or a door reader and take control directly through the Cisco Physical Security Operations Manager interface. Operators are able to execute a wide range of actions in their domain, such as viewing live and recorded video, taking control of PTZ cameras, executing door commands, taking photo snapshots, and exporting video, just to name a few. * Video matrix and guard tour. Video streams can be presented to the operator in individual windows or in a matrix view (Fiigure 2). The video windows can also be configured to rotate through camera views based on predefined camera sequences and times. * Centralized alarm management. The centralized console allows generated alarms to be automatically shown on the maps. Based on user preferences, alarm details can be automatically displayed, or displayed by an operator with one click of a mouse.